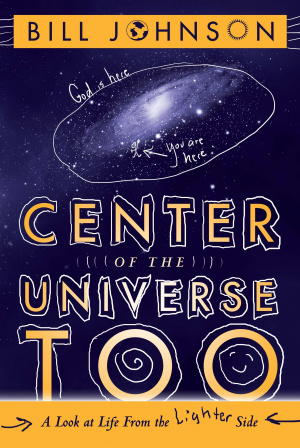 After the humourous first installment, Bill Johnson seems to walk into strange, spiritual and hilarious situations on a daily basis as he reveals in ‘Center of the Universe Too’. With 85 new short stories, each fitting on a double page, Bill treats us to the inner workings to his spiritual church and his supernatural life. As you read these quirky tales, you’ll read wisdom between the lines, laugh with hysterical dimensions and be filled with belief that the impossible happened everyday with God. BILL JOHNSON is a fifth-generation pastor with a rich heritage in the Holy Spirit. Together Bill and his wife serve a growing number of churches that have partnered for revival. This leadership network has crossed denominational lines, building relationships that enable church leaders to walk successfully in both purity and power. Bill and Brenda (Beni) Johnson are the senior pastors of Bethel Church, Redding, California. All three of their children and spouses are involved in full time ministry. They also have nine wonderful grandchildren. Center of the Universe Too by Bill Johnson was published by Destiny Image in June 2013 and is our 16795th best seller. The ISBN for Center of the Universe Too is 9780768403251. Be the first to review Center of the Universe Too! Got a question? No problem! Just click here to ask us about Center of the Universe Too. In the anticipated sequel to Bill Johnson's first compilation of humorous stories and insightful experiences, Centre of the Universe Too shares the heart of a pastor who loves God, enjoys life, and will have you doing the same. You are treated to 85 treasures in short story form. From late-night encounters in God's electric presence and exploding briefcases to stewarding the remote control mantle and a powerful prophetic word continuing to be fulfilled, these unique stories seamlessly blend the extraordinary and common. A leading voice in the global church, pastor Bill warmly invites you to journey alongside him, introducing the Charismatic mafia of the 1987 conference circuit, rabbit hunting, sweater shopping, (painless) ice cream feasting, zealous sleeping, big-brained cousins and an attack goose. Get ready to think, laugh, and believe for the impossible in a place where the everyday and supernatural collide  the Centre of the Universe. Chapter 7: What to Wear? Chapter 20: You Are So Cute! Chapter 27: What’s Important in the End? “This book is written from a creative and lighthearted perspective. As a very entertaining and fun read, I highly recommend this book!” — Mary, Amazon Review. “This book was funny, inspirational, and very enjoyable to read. Love learning from this mans' insights and journey through the years.” — crystalcarols, Amazon Review. “Great stories of faith that will help you grow as a Christian. You will laugh and cry as you read these stories. It will encourage you to move on with the Lord.” — Dottie Miley, Pennsylvania, Amazon Review. “The Center of the Universe truly is a look at life from the lighter side. With short chapters containing day to day stories and insights, I have found myself laughing out-loud continuously…” — Mary, California, Amazon Review.